Banyoles is a quiet town. 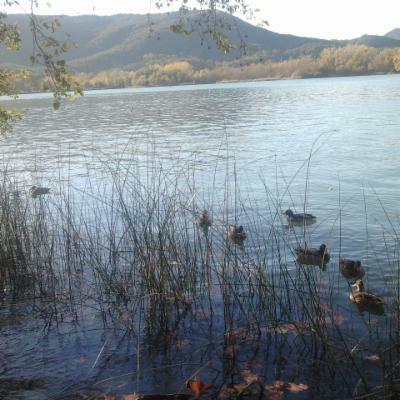 It's situated immediately next to the biggest natural lake in Catalonia and surrounded by wild countryside. It has an old town and many squares where you can sit in restaurants and bars. There is a farmer's market once a week in the next street from the house. There are also bars and restaurants around the lake and people wander under the trees and feed the ducks. There is a rich wildlife and protected areas for all kinds of birds as well as a stork sanctuary. You do not need to move if you choose not to as there is plenty to do- swimming, walking, socialising, but if you should wish to explore, it is ideally situated both for sightseeing- Girona, Barcelona, Figueres, Besalu ( a medieval town 15 min drive)or, for the more nature loving, the volcanic area of La Garrotxa, the mountains and rivers are but a short drive away.